Special Omega-3s fatty acids particularly EPA (Eicosapentaenoic acid) and DHA (Docosahexaenoic acid) from refined fish oil are particularly important to counteract Omega-6 imbalance. Our pets often unwittingly receive an unnatural diet which is too high in Omega-6 fatty acids derived from high levels of cereals and vegetable proteins. 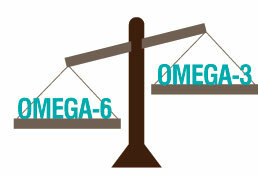 Feeding additional Omega-6 fatty acids can make some skin worse. It is for this reason nutramega contains high strength Omega-3 fatty acids and does not include any added Omega-6 fatty acids.